Hey!! Well today has been pretty good so far. Thanks for all the birthday wishes! We have been really tired in the mornings lately and we decided to go run a little bit in the morning. Although it was hard to get out of bed and do it I felt really good after running a little bit. Hopefully will keep up the habit this week haha. Things are going pretty well here in the area. We cleaned the apartment a little bit and I think later on we might go and buy a cake or something. This week one of the cool little experiences we had is when we went to visit a less active family. We taught the grandma a little bit more and she had some misconceptions about the church we were able to clear up. Her name is Nancy, and we taught her a little bit about the restoration of the Church of Jesus Christ. We saw her in the morning sunday and she was feeling a little sick but told us she´s going to go with her family to church for a little bit and then to the doctor afterwards. She enjoyed church and it was awesome to see that she came with us still even though she wasn´t feeling too great. There´s another family we´re teaching too. Part of the family are members of the church but the dad, Martin, and one of his daughters named Mariela aren´t. 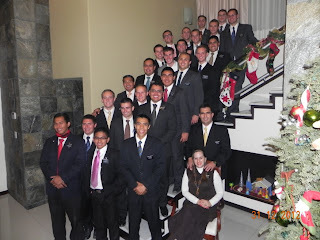 They´re really friendly and we gave Martin a book of mormon. We want to share some more messages with them this week so we´re excited about that too. Besides that there´s not too much going on. We´re feeling better now that there a few people to teach, but are going to keep looking for more with the down time we have. One of our goals is to visit a lot more of the part member familys in the branch and help reactivate familys. There was pretty good assistance in the branch this last week, so we were happy to see that there´s progress going on with that too! Anyways, thank you all for your support and I hope everybody that had vacation got to enjoy it and those that a working and going to school can enjoy it too! Have a great week and I know that the Lord will help you guys in your goals if you ask for his help and are humble enough to follow his advice! The humble part is really important!